Heart valves are flaps of tissue within the heart. They open and close to allow blood to flow into the correct cardiac areas in the right direction. Blood is supposed to flow from one of the heart's four chambers to the next. Closing a valve prevents any blood from leaking back. When one of the heart's four valves becomes too diseased or damaged to function properly, blood does not reach the proper area in the right volume. The only effective treatment is valve replacement. Valve replacement was not possible until the advent of open-heart surgery in the 1950s. Researchers set out to design a valve that could be easily implanted, have a low rejection rate, would not promote clot formation, and enjoy long-term durability. American surgeon Charles A. Hufuagel (1916-) inserted a tube-and-float device into a patient's descending aorta in 1952 to prevent aortic backflow. In 1960 Dwight Harken implanted an artificial cardiac aortic valve into a patient. Nina Braunwald replaced a mitral valve with an artificial one shortly after that. The first completely successful artificial heart valve was designed and implanted in a human patient by surgeons Albert Starr (1926-) and M. L. Edwards in Portland, Oregon in 1961. Their device, the Starr-Edwards valve, is now a standard in the field. The valve is made of a combination of materials and includes a hollow metal ball, an alloy (metal composite) cage, and a Teflon base. 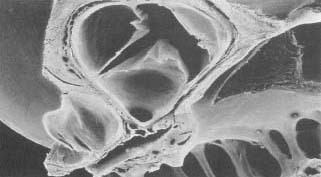 Heart valve designers and manufacturers later took advantage of new technologies developed for the space program and included materials like Pyrolite carbon, a strong and durable new substance, in artificial heart valve designs. An electron micrograph of a human aortic valve. not require anticoagulation medication, but porcine valves do not last as long as mechanical heart valves. My grandmother, Hellen Diane Champion, received the Starr-Edwards valve in Aug. of 1969. To my knowledge she was the longest surviving patient of Dr. Starr (38 years). She passed away in 2007 from causes unrelated to the valve. If not for Dr. Starr and Dr. Edwards I would never have known my grandmother. I was one month old at the time of the surgery. I remember asking grandma, "Did you swallow a clock?" She ticked from the sound of the ball clicking against the cage within the valve. This memory is so vivid in my mind, and I am eternally grateful to both of these miracle working doctors! Is there any other alternatives besides implanting artificial heart valves? My dad had this surgery in 1967 and died of unrelated causes in 2000. I could hear his valve clicking when it was quiet. So glad that we had him around for an additional 33 years! I recently was diagnosed with a bad heart valve. My weight and blood pressure is fine at the moment. I am 60 years of age and follow a minimum of two one hour exercise sessions per week. I follow a strict diet and my cholestral is good.My cardiologist has scheduled another stress test in 6 months. At this time he said valve replacement in four or five years would be neccessary. Is there anything I can do to strengthen my heart valve to avoid this surgery. My Aunt died yesterday 26th June 2012, she was 92 - she was fitted with a Starr-Edwards valve in April 1973 and led a more or less normal life for just over 39 years. Thanks to the inventers, I had my Aunty for an extra 39 years. I worked for Carbomedics for over 20 years,and did the start up in Austin, Texas. PyC is magic for mechanical heart valves, and if you get a mechanical valve it will be made of it. The new valves use Pure Pyc, and the Carbomendis valves were the allow of PyC, and silicone carbide with the trade mark name of (Pyrolite). Obbligato, Inc is an Austin based company that uses PyC for musical instruments. Here in Austin for that application it is also magical too. See USPTO UTILITY patent 8,110, 729. Also do a google search for Jack C Bokros, and Jonathan C Stupka. We had accelerated wear testers in R&D that beat so fast you had to use a strobe light to see the leaflets move. They tested the wear of 15.000 years in just a few months of operation. When they took the valves apart after that, they were still in spec, after 15,000 years of heart beats. The St. Jude medical was the first solid PyC bi leaflet valve in the world. With the newer pure PyC valves with better flow some people can just take an aspirin a day for a blood thinner. We have come a long way since 1926.